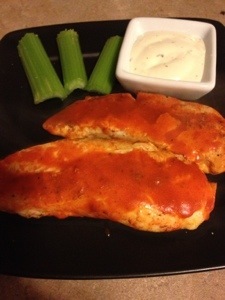 These were a yummy substitute for hot wings. I’ll make them again for sure. 1. Mix garlic, chili powder, black pepper and paprika in a dish. 2. Rub spice mixture liberally over surface of tenders. 3. Place tenders on a baking sheet sprayed with nonstick spray. 4. Bake at 375 for 10 min and remove from oven. 5. Pour wing sauce in a shallow dish and dip each tender until covered. 6. Return tenders to oven for 10 more minutes, or until done throughout. Timing may vary based on size of tenders. Yum. I’m always looking for a recipe with this type of sauce. Husband’s fav. Plus Blue Cheese.